This is the Apple Blossom Cottage. 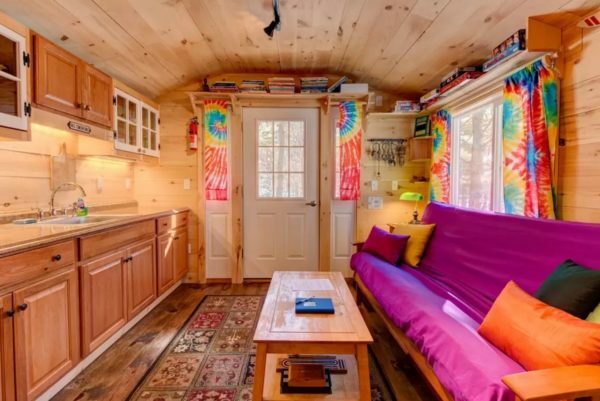 It’s a tiny house in Jamaica, Vermont. And you can book a stay in it if you wish! This charming little cottage is built by the Jamaica Cottage Shop. If you enjoyed this tiny house tour you’ll LOVE our Free Daily Tiny House Newsletter with even more! Thank you! As someone who really isn’t into bright colours (psychedalic 70’s passed me by) I actually like it. Probably because it isn’t overdone. Just the door and door frame. This looks like it is more like 10 feet wide.???? Nicely laid out. Hi! I really like it very cute… can i have it for free i want to have a tiny house like that… so sad i cant have it because im in the philippines. I Love these Colors. They are Artistic and thean, Positive! I do like the bright colors. While I do appreciate all birds, I will always prefer the clothes of the male peacock over those of the wild turkey. Why tread softly when you can dance? Love the colors. I don’t like the bedroom. Bunk beds are not for me. Why is the toilet up off the floor? Wires running up by the ceiling in bathroom is ugly. I would like to see more pictures of kitchen. I wanted to leave a comment, not report this post….the link is broken, I’m afraid. Since I’m here, my reply to Maria is this; those are hot and cold pipes for the water in the bathroom. I’m guessing it is inside because in Jamaica, VT the winters can be brutal, so rather than deal with frozen pipes, I’m sure they drain the system, but also keep the pipes inside where there is a heat source. Just my opinion. And, I agree with you….not attractive to see where they are. Toilet on the platform….hmmm…not sure, unless it is a hidden area for a “honey pot”? No outdoor pipes there either, perhaps. And a soffit could easily be built over those pipes to hide them. Wow, I am from Jamaica and knows that houses are made in different shapes and sizes but did not know that there was a place that actually subscribes to the tiny/small house living. I have sent my contact off to them so that I can get my tiny house built in Jamaica. I love this. It is not actually in the Island of Jamaica!!!!! You mean it is not in the beautiful Island Jamaica WI?!!!!!! I absolutely adore the Jamaica Cottage designs – in fact we are looking at one of them for our own tiny (on foundation). I also love the Jamaica Cottage houses and am planning a trip to Vermont in September and while I am there will check them out to see if this will work for my tiny home I plan to build in Virginia. Absolutely adorable. The bed room would be more desirable with one big bed. Is this a rental? Can you send me info and season prices if it is. Thanks much. Cute, but I see some problems…. Fire hazard: The electrical panel in the bedroom has been fitted in an open closet area – so naturally someone craving storage space has installed shelves and a hanging bar above and below the access door to the electrical panel. That was evidence of poor planning. Panels should be placed with 3 feet of open space around them to ensure quick and easy access in an emergency (at least that’s the code here in Canada). I know that can be tough in a tiny house, but putting it in a closet?!? Basic laws of physics apply to tiny houses (and trunks of cars, and women’s purses, etc …) Aristotle’s Law of Horror Vacui – Nature Hates a Vacuum – if you have an empty space, you will fill it. It’s human nature that that closet will be quickly crammed with stuff, like clothes, and storage for the bathroom (there doesn’t seem to be any there) rolls of toilet paper, paper towels, and all sorts of highly flammable items. Please use common sense if you are contemplating copying this house and relocate the panel to a space that you cannot possibly obstruct. In this case, a simple work-around would have been to move it 2 feet, and on the other side of the dividing wall to directly behind the bathroom door – always accessible and not too close to a water source. Emergency Exits? – The bedroom window (which is also the emergency egress) is partially obstructed by the ladder for the bunk bed. it looks like it is a slider, so hopefully it was set-up so that the left side opens (instead of the right side which is completely obstructed by the actual bunk bed). For that matter, what thinking person sets up a ladder next to a window? One sleepy misstep in the middle of the night, and it’s a quick trip to the local emergency room for stitches….. Toilet Sanitation? The side of the toilet bowl can’t possibly be more than 3 inches from the wall. Best case scenario, it would be extremely uncomfortable to use , even an extremely skinny person would be squished using this set-up. Worst case scenario, it is most certainly a difficult-to-clean filthy mess. Building codes require 15 inches from the centre of a toilet as a setback from walls or cabinets for a reason, and some codes are now moving towards 17 inches for accessibility. In this case, the owners should have considered a corner-toilet instead. Otherwise it is cute, and the general layout is less cramped than the typical tiny house. With a few common sense changes, it looks quite livable. I was confused about the red and blue wires, which turned out to be water pipes…..still not sure why they are so visible! The bedroom is set up strangely – the storage seat won’t work with a hanging rail just above it! The bottom bunk might work for an adult couple who don’t mind bashing their heads every time they get up! Or is that whole bedroom meant for children – you could probably pack a few of them in there and they would think it is fund! The sofa looks like it could be a sofa bed, and I presume a second couple or parents could sleep out there. Parents and kids in the bedroom, unless said kids sleep VERY soundly and parents don’t snore, wouldn’t work!! I am in 2 minds about having a coffee table in a Tiny House – just seems to take up space unnecessarily! I agree about the difficulties the toilet presents. However, this house, like so many others, gives us all food for thought. If we are thinking seriously about downsizing to small or tiny, this house offers some insight in to what to do and what to avoid! I’m looking into a Jamaica Cottage Shop pre-cut kit myself. I would buy a fully assembled building but I am just over their 200 mile shipping range for built units. It’s clear to me that the adults sleep on the convertible futon couch in the living area while the children get the bunkbeds. Yes, not much privacy in the tiny house. The red and blue water pipes should not be covered because they are more likely to freeze. In seasons when no heat is needed they could be gently taped over with wide tape in a color to blend in with the walls. and it had to be on a raised platform. The main issue I see is the lack of clearance between the toilet and the side wall. I’m not sure the average leg would fit in that tight at space. It could have been solved by the toilet turned, but the I realized, oh, boy, that would expose the back pipes to the outside wall. A no-no. So the only suggestion would be using a corner sink instead of the one one the wall oppsite the toilet so the toilet could have more clearance. Laughter? Is a world full of color! I actually like it, love the colors. Would have to incorporate a w/D somewhere – perfect. the metal “slats” used for the porch fencing look familiar. as though they were originally part of something larger, but were recycled/reclaimed for this project. does anyone here know what they are? thanks!